Looking to renovate your home’s interior or exterior in Palm Beach Gardens, Florida? You came to the right place! We stand out from our competitors for our experience, value and selection of services. 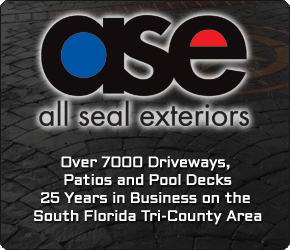 After all, we are the #1 Choice in Stamped Concrete and Pavers in Palm Beach Gardens. I found All Seal Exteriors to be an honest to goodness refreshing experience in completing my concrete project. They were very helpfull, professional, and most of all prompt in both their estimate visit, and actual job arrival times. The work was completed within their estimated time and to my complete satisfaction. I would recommend them to anyone.